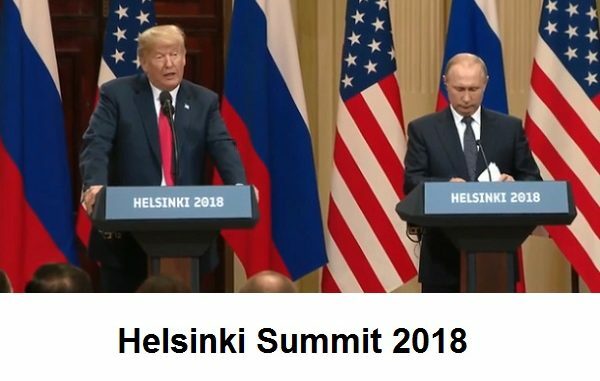 The Helsinki Summit between President Trump and President Putin took place on Monday, July 16, 2018. The meeting between the leader of the United States and the leader of Russia followed the tumultuous Brussels Summit held just a few days prior at NATO headquarters. The two presidents met for two hours privately and then both participants spoke during a joint press conference. This was an occasion for the two leaders to discuss important issues such as Syria, Ukraine, Crimea, the Baltic States, cyber warfare, and more. But . . . The biggest news coming out of the press conference that captured the attention of the press and political commentators was concerning the accusation of Russian meddling in the 2016 election. The topics of Crimea, Ukraine, cyber warfare, Syria, the Baltic States, Russian hybrid warfare, and others seemed to take a backseat. President Trump said during the press conference (Monday, July 16, 2018) that he believes Putin’s statement that Russia did not meddle with the U.S. election. He says that he doubts the information provided to him by U.S. intelligence agencies. “The role of the Intelligence Community is to provide the best information and fact-based assessments possible for the President and policymakers. We have been clear in our assessments of Russian meddling in the 2016 election and their ongoing, pervasive efforts to undermine our democracy, and we will continue to provide unvarnished and objective intelligence in support of our national security”. In other news, the Department of Justice Office of Public Affairs released (Monday, July 16, 2018) a notice that announced the arrest of a Russian national. She was charged with conspiracy to act as an agent of the Russian Federation and “. . . infiltrating organizations having influence in American politics, for the purpose of advancing the interests of the Russian Federation”. On Tuesday, July 17, 2018 President Trump, recognizing the damage done, attempted to walk back some of his comments. Just a double negative, move along, nothing to not see here . . .
President Trump would like you to think that he is protecting our future elections from Russian meddling and he is standing up to Russia’s malign activities. He is doing a little ‘walking back’ of his bizarre and insulting comments made on Monday. Read a statement issued from the White House today (Tuesday, July 17, 2018). It will take some time for things to shake out on any positive outcomes on the meeting between Trump and Putin. The State Department and White House will surely be putting out some official news releases. Supporters of Trump (I am thinking Fox News) will certainly look for some ‘good news’ aspects of the summit and let us know about it. Watch the video below if you want the White House version on the results of the Helsinki meeting. Video of President Trump discussing his visit to NATO, United Kingdom, and Helsinki, White House, July 17, 2018. It would be awesome if Trump got some movement with Russia on settling the Syrian conflict, applying pressure on North Korea on the denuclearization issue, lowering the temperature in eastern Europe, or on a host of other issues. Hopefully we will soon hear some good news from what has been widely regarded as a political and diplomatic misstep on the part of President Trump. Photo: Department of State photo depicting President Trump and President Putin a joint press conference immediately after the Helsinki Summit, July 16, 2018.